After defeating the uprising, and becoming infected with a dose of Plush, Holly is in a race to help a seeker before it’s too late. Going South is the only option. But getting there is going to prove difficult, which is why Lockland has entrusted Daze with a secret weapon. A pulse storm, overzealous militia, and uncooperative siblings are only a few of the obstacles standing in their way. Once they arrive on the coast, the prospect of finding the supplies they need dwindles. But what they uncover may be far richer. A way to move the remaining survivors forward. But the people of the town don’t see it that way. They want to protect what’s theirs. With the militia closing in, they do the only thing they have left to do, fight. 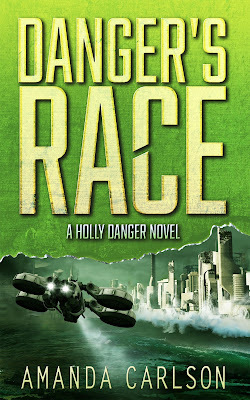 Danger's Race picks up immediately from where the last story left off - with Holly and the rest of her crew setting off on separate missions to find the ingredients needed for Darby to create a bulk supply of the cure that will save the seekers and remove their addiction to plush. Holly and her sustainee Daze are headed South in search of a vital but very rare component and it makes sense for Case to accompany them since he is familiar with the area, even if Holly isn't quite sure he can be fully trusted. What they find turns out to be even more valuable than they ever could have imagined but it also comes with a whole new set of dangers so things are about to get complicated. I've been really enjoying this series and it's been great to have the first 3 books released so close together so that I don't have any trouble remembering what is going on. Although she reminds us of the important things Amanda Carlson doesn't waste a lot of time recapping previous events so things never get repetitive and boring but that does mean I would recommend reading the books in the correct order to make sure you don't miss anything. These books have been full of action, the futuristic world is well thought out and believable, I like the camaraderie between Holly and her team, the technology is interesting and the plot is constantly moving forwards. Travelling out of the city means we don't spend much time with the rest of Holly's crew but we get the bonus of meeting some new characters who are likely to have interesting roles as the series continues. This is a brutal world though so not everyone they meet are friendly and they're facing danger at every turn from a militia group that are trying to consolidate their power base in the South. I really don't want to give too much away about the plot but things are definitely about to get complicated for Holly and Case. The series is just getting stronger with every instalment and I can't wait to see where Holly's journey takes her next.